(Nanowerk News) In a new study, researchers from the U.S. Department of Energy’s (DOE) Argonne National Laboratory have determined that electrons in some oxides can experience an “unconventional slowing down” of their response to a light pulse. “It’s as if the electron is spending two years or more dithering between states when normally it could make up its mind in a minute,” said Anand Bhattacharya, an Argonne materials scientist and co-author of the study, published in Nature Communications ("Unconventional slowing down of electronic recovery in photoexcited charge-ordered La1/3Sr2/3FeO3"). In a crystal, all the atoms form a periodic structure called a lattice, where the atoms are arranged in a repetitive pattern in three dimensions. The properties of electrons living in this space typically obey the same periodicity. But below a temperature of about minus 100 degrees Fahrenheit, the electrons in the study material, lanthanum strontium ferrite, find it more energetically advantageous to cooperate with the lattice and magnetism on the iron atoms, to form a new periodic structure called a magnetically driven, charge-ordered state. The behavior occurs close to a temperature that marks a phase transition — similar to the way in which 32 degrees Fahrenheit marks the phase transition from water to ice. But the phase transition studied here is peculiar because it marks a transition between a magnetic insulator and a non-magnetic metal. 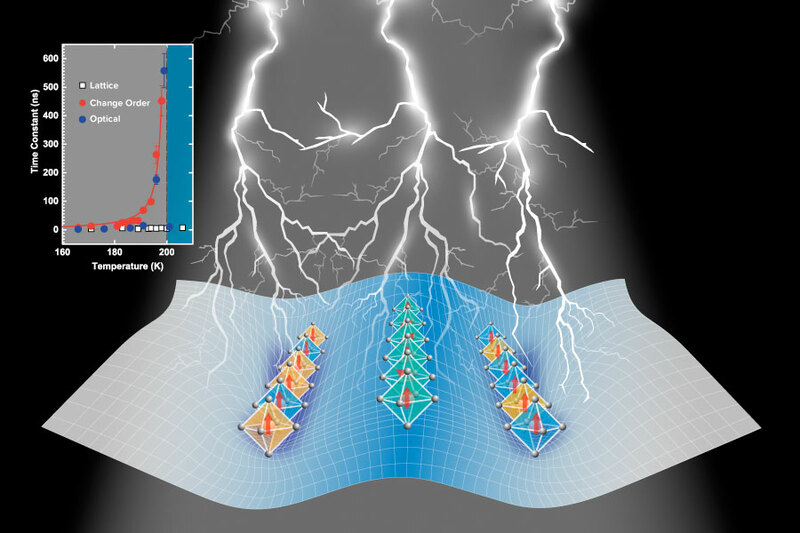 According to Bhattacharya, these sorts of phase transitions are potentially useful as 'switches,' where a material’s 'on' and 'off' states can allow us to toggle between metals, insulators, magnets and superconductors. However, the material studied — known as La1/3Sr2/3FeO3 — had a surprise in store. “We’ve discovered that electrons can be very slow to return to their homes after being kicked out from the ‘ordered states,’ taking much longer than we previously anticipated,” said Argonne physicist Haidan Wen, another co-author. Because the electrons are lighter than the atoms in the lattice, they usually react more quickly to the light pulse, settling into their new state before the lattice comes to rest. But in this case, the electronic recovery lasts much longer than the lattice recovery, as determined through experiments conducted at the Advanced Photon Source’s (APS) beamline 7ID-C and at the Center for Nanoscale Materials (CNM), both DOE Office of Science User Facilities. The researchers conducted transient optical reflectivity measurements at CNM with Argonne scientist Richard Schaller and observed that, as the temperature approaches the phase transition, the electron relaxation slows down by orders of magnitude. Complementary hard X-ray diffraction at the APS measured structural changes to determine how quickly the lattice and charge-ordered phase evolved. According to the authors of the paper, the abnormal behavior of electrons is likely a result of magnetic interactions. Conventionally, the two regions on either side of a first-order phase transition are quite distinct, like water and ice. However, Argonne theorist Hyowon Park, who holds a joint appointment with the University of Illinois at Chicago, found that, due to magnetic interactions close to the phase transition, there are actually two different kinds of charge-ordered states. When the excited electrons try to go back to the charge-ordered phase, they find a very shallow downhill slope into one of the two charge-ordered states, which ultimately slows down the ordering processes. Further experimental work would be needed to gain microscopic insights on exactly how the electrons organize themselves spatially between these two charge-ordered states. For both Bhattacharya and Wen, understanding these “slow” processes in the realm of ultrafast phenomena may offer new ways to stabilize or increase the lifetime of exotic transient states that occur after a material is hit with a light pulse. Such insights may reveal potentially useful properties related to magnetism, conductivity or even superconductivity.